This 3DS exclusive title will cross the pond to the US in 2014. Professor Layton and the Azran Legacy, the latest Layton puzzler to tax your brains, will arrive in Europe on 8th November. Over 500 puzzles await, as you try to find out why Targent has kidnapped a girl who spent the last few centuries entombed alive in an icy prison. The legacy of the ancient Azran civilization hangs in the balance, as Layton, Luke and Emmy embark on the Professor's greatest adventure. 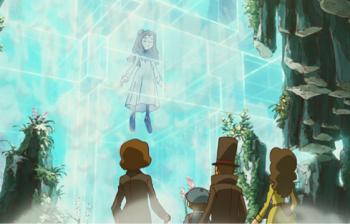 The events of this game take place right after Professor Layton and the Miracle Mask, but long-time fans will find much here to celebrate, as the plot here links all the way back to the first in the series, Professor Layton and the Curious Village. In addition to the brain-crushing puzzles, there are three new mini games to tease you. Dress Up has you playing fashion consultant, advising the characters you meet on how to put together the very best outfit. Nut Roller has you playing as an entirely different kind of consultant, as you help a squirrel defeat an obstacle course and collect walnuts; Hint Coins are at stake in this one, which can help you solve one of the many, many puzzles on offer. Blooms and Shrooms has you playing gardener, trying to create the best floral paradise without accidentally creating too many poisonous mushrooms. On top of all this, there's Treasure Hunt mode, which lets you challenge other players via StreetPass to find collectables. Success here gets you decoration for your airship, and special cut scenes with characters from past games. This 3DS exclusive will be the last of the series to star Professor Layton as a protagonist so, if you've grown fond of dashing Hershel, you've one last chance to help him solve the grandest puzzle of his life. He's on the cusp of understanding everything the prequel series has been building to so far and, come November, the Azran secret will be revealed.